When building a detached garage plan, shed, outbuilding, barn or carport, The Garage Plan Shop recommends planning ahead when it comes to electrical wiring. All of the above mentioned structures are flexible and can be used for of a variety of purposes, so the first thing you need to think about is how you will use the structure. Will you use your garage or carport just for parking cars? Will you need lighting in your garden shed? Do you plan to use power tools in your outbuilding? Knowing how you plan to use your new addition will help you plan for electricity. 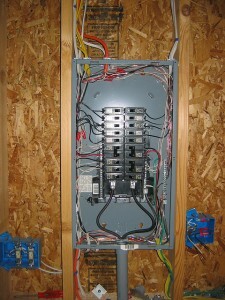 Begin by hiring a licensed electrician to help you. Let this professional review your garage blueprints to get a better understanding of the completed structure. With your electrician, come up with an electrical plan to accommodate your needs. This will keep you from over-wiring your structure and spending more than you need or electrical outlets, switches and fixtures. Your pre-determined electrical plan will also ensure that you have everything you need to use your new garage, carport or outbuilding the way you wish. Furthermore, it is better and less expensive to install electrical wiring during construction than it is to go back and retrofit the building for additional electrical needs at a later date. Talk with your electrician and determine what types of outlets and fixtures you’ll need to accommodate your specific needs. Consider amps and voltage. Read packaging and labels to determine what each of the above items will require. Have the electrician install outlets, fixtures, switches, circuit breakers and the electrical panel accordingly to accommodate all of your needs. Anticipating your electrical needs for your new utilitarian structure will ensure you new outbuilding, garage or shed plan will accommodate all of your needs while paying the best price by installing wiring during the construction phase instead of after the building is finished.